This is a nice little drum machine. It is perfect for any genre of music and it even has an input for guitar players to plug in and play along to a drum sequence. It is very easy to program and has tons of drum, percussion and bass sounds. Roland has an amazing SRX library of sounds that are incorporated into this small, yet powerful machine. 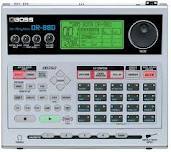 I have had several drum machines in the past. Besides the Alesis ASR-16, this is also one of my favorites. It has 20 drum pads to work with and assign sounds to. You will be impressed. It sells for around $520 at Guitar Center.